Cheela is a quick and simple north Indian breakfast. The usual breakfast in a north Indian household is Roti and Sabzi (Indian bread and a vegetable). It is time consuming but quite filling and nutritious. However, when the housewife feels that the children need a change and also there is a time crunch on her hands, she would try these quick recipes. 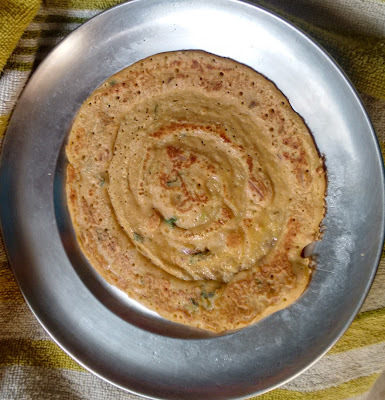 Chopped onion, ginger and green chillies are added to the besan flour (chickpea flour) and a batter like consistency is prepared with adding water and salt. Then this preparation is fried on a pan both sides. This can be served with a little sauce or chutney. Chickpea is very nutritious. These days housewives have started experimenting. They mix half of besan and half of wheat flour to make it more tasty and many more vegetables or chopped coriander could be added to create a little extra zing and nutrition. It is a quick bite and light on stomach. Children can carry these in their lunch boxes.